-Jill Cooper with Never Again California. This quote says it all. A bill brought to the Assembly Public Safety committee to ban the sale of firearms and ammunition at the Del Mar Fairgrounds was passed through the committee yesterday. The bill, AB 893 (Gloria) comes at a time when 2nd Amendment culture is under attack. Despite CRPA and other pro-2A groups’ best efforts to show our opposition and the negative affects of the bill, it was passed through the committee by a 5-2 vote. AB 893 (Gloria) will now be assigned to another committee before heading to the floor. 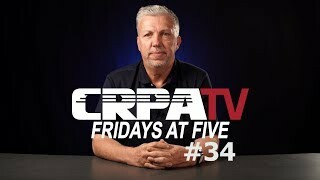 Stay tuned with CRPA for updates on anti-2A legislation. If you look at the calendar for the Del Mar Fairgrounds, you will see that they regularly offer horse race betting, bridal fairs, and other things I find offensive or don’t support. If you don’t want to buy into the entire “weddings as expensive events” nonsense, or betting on animals being used for human gambling purposes, do we shut down those things too? Her argument is facetious on its face. She’s anti-gun, except when it comes to her personal protection, the police responding to problems, someone killing her meat for her, etc. Hypocrisy thrives in the political class.